Cook, Serve, Delicious Update #7: Boosters and Detractors | Vertigo Gaming Inc.
Today I thought we’d take a look at a new segment of the game called Boosters and Detractors, which will change up the strategy of Cook, Serve, Delicious in a whole new way. When you’re shopping around to buy the latest foods to serve on your menu, you’ll notice a cluster of icons on the left, as shown last week. These are the Boosters and Detractors, and they’re very important on deciding which foods you should serve, and which ones you might hold back on. Your Active Menu is what’s currently being served in your restaurant. So while there’s twenty foods to choose from, you’ll only be able to serve six at a time. But don’t think you can just settle on your favorite six and relax…these new variables can really change the game, whether it’s the “Menu Rot” detractor that decreases a food’s popularity every day it’s on the Active Menu, to a “Health Nuts” booster that increases your menu’s buzz for every healthy food on the menu. “The Muncher” – A food that’s generally known as a snack food, and won’t be ordered during the Rush Hour. “Menu Rot” – This food will decrease in popularity for every day it’s on the active menu, leading to negative buzz. Remove from the menu for at least two days to help this food regain it’s neutral buzz. “Rainy Day Food” – Makes for a great rainy-day food, and will add 5% to your buzz rating if on the Active Menu during bad weather. “Simply Food” – A generally easy food to prepare, with one to five recipes. “Trashy” – Has a lot of waste byproducts when cooking, resulting in an increase of trash chores. “Midday Treat” – A great way to cool off during the afternoon, resulting in a 2.5% buzz boost during the mid day hours. “The Fats” – A fatty food frowned upon by weirdos. Having three of these fatty foods on the active menu at once is a -10% buzz drainer, with -5% buzz per additional fatty food on the menu. 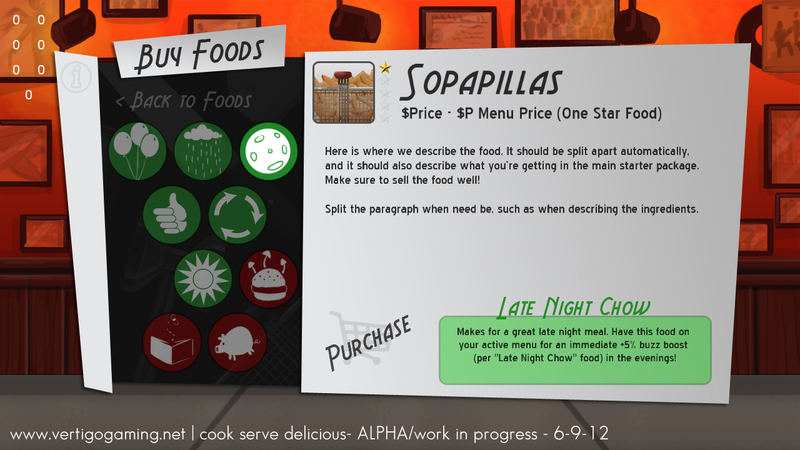 There’s plenty more of those, but you can see how careful planning of your Active Menu is a must in this game. Next week I’ll show off some more foods and talk a little bit more about my release window, so cya then! this just keeps looking more and more fun! i am so excited for this game. One of the major weaknesses of ONR2, I think, was that certain foods were just plain better than others for making money (screw you fries), and there was no way you’d be better off with all 12 foods on your menu than, say, 9. This sounds like a good way to make people vary their choices a little bit, especially menu rot.